SEOUL, Oct. 11 (Yonhap) -- Russia's top envoy to South Korea said Thursday that the North Korean nuclear standoff and all other peace issues in Northeast Asia should be resolved within the framework of six-party talks. 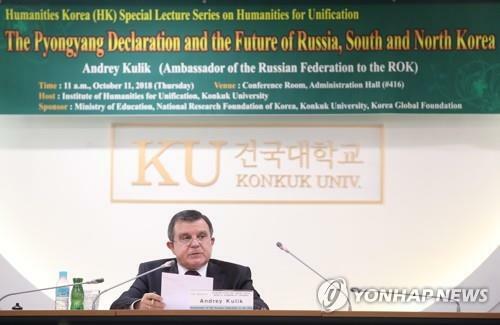 Ambassador Andrey Kulik made the point during a special lecture at Seoul's Konkuk University amid expectations that North Korean leader Kim Jong-un will likely make his first visit to Russia as the North's leader in the near future. Kulik said that it is important to resolve the nuclear issue peacefully within the framework of six-party talks, and that the denuclearization process should move forward based on agreement from all related countries. It is also important not to try to resolve the complicated issue in a hurried manner, the envoy said, adding that related countries should take sufficient time in finding a solution as they have their own positions. Russia is a member of the six-party nuclear talks that also involve the two Koreas, China, Japan and the United States. The negotiating process, launched in 2003, produced some denuclearization deals, but all of them later fell apart, and the process came to a halt after its last meeting in late 2008. Kulik welcomed inter-Korean peace talks, saying he firmly believes that implementation of summit agreements between the two Koreas would be conducive to reducing tensions on the peninsula and ensuring lasting peace in the region. He also voiced opposition to pressuring North Korea too hard, saying it's important to work closely with Pyongyang so as to get the regime to denuclearize rather than trying to pressure or isolate the country. The envoy also called for greater trilateral economic cooperation between the two Koreas and Russia in such areas as transportation, logistics and natural gas, saying such cooperation would also be good for peace and security on the peninsula.